Cleaning your charbroiler every day will make it last longer and produce better results. It's a good idea to wear cleaning gloves while you are cleaning your charbroiler. While the charbroiler is still hot, but not on, use a wire brush and scraper to remove any stuck-on particles of food or fat from the grates. After you've cleaned the tops, flip the grates over and clean the bottoms. Once the charbroiler has cooled completely, you can use a damp cloth or sponge dipped in soapy water to clean the rest of it. A ready-to-use degreaser like Formula-D can be used too. For really stubborn grease or carbon buildup, use a heavy duty degreaser like Blast. It works best on a warm surface, and make sure you thoroughly rinse it off after use. On a radiant charbroiler, you'll want to clean the radiants too. It's easiest to do this in a sink. Make sure you empty and clean the drip trays, too. Keeping water in the drip trays makes cleanup easier, and helps prevent grease fires. If you have a lava rock charbroiler, you might consider flipping over the stones every few weeks to get any accumulated grease on the tops to burn off. Most manufacturers recommend changing the stones at least twice per year, but you may need to do so more frequently depending on your usage level. 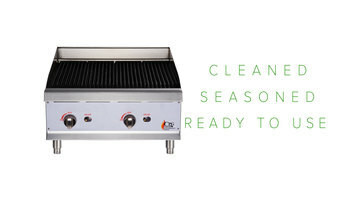 See how easy it is to clean your charbroiler by watching this informative video! The Avantco refrigerated chef base is a great way to keep your most frequently used ingredients close at hand while you prepare your signature dishes! 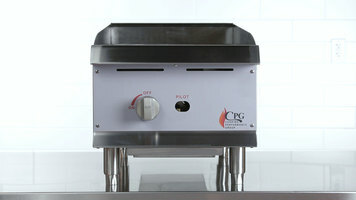 For easy installation, efficient cleaning, and signature grill marks, use this quality CFG countertop gas lava briquette charbroiler. 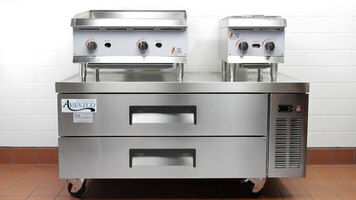 Available in a variety of sizes, you can select the broiler that fits your needs and countertop. Check out this video!